Just saying 'Hello' - I know I'm much later than usual, so before anyone worries, here I am. I've had a busy day so far with 2 consecutive water aerobics classes, running errands, and baking a ham. It's Friday! Beautiful Friday, and Superbowl Sunday is right around the corner. 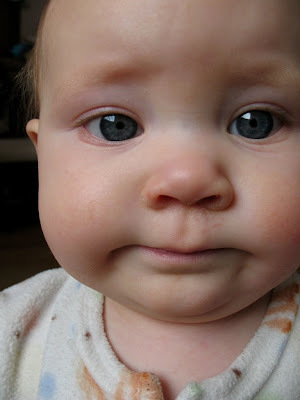 Here's a darling photo of little Savannah's face - she's just the sweetest baby girl! That reminds me to start looking at airline tickets for Memorial Weekend - gotta get 'em early! Day 1075 - Friday minus 1! Greetings, Bloggy Thursday but not Friday-ers! It is almost the end of January - where did the month go? It's time to pay bills already. By the way - OUR weather wasn't too bad yesterday, the ice was much further north. 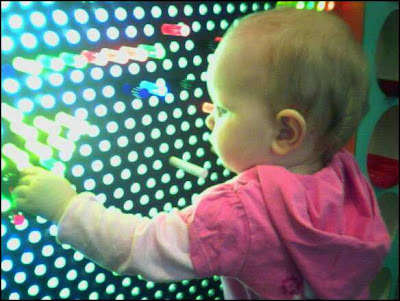 Here is another photo from the Childrens Museum - Savi playing with a giant Lite Brite. Too cute! Hey, dream dictionarians - I had a VERY unique dream last night - even for ME! I was in a city, and GRAVITY wasn't working properly there. Gee whiz! The cars were casually moving down the street on their own, and had to be brought back. There was also some dense, white 'stuff' in some spots - like a mattress over the ground. It was solid but wasn't supposed to be. I had to caution some kids not to play near the cars because when 'normalcy' happened, the cars would drop. Gravity reverted back to normal in just one scene of my dream, and a roadster kind of car thudded to the sidewalk. I'd like to dream s'more of that! TTFN! It's Midweek and Midlife again. 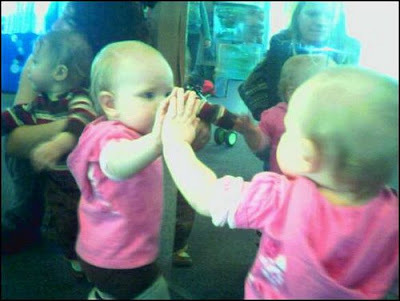 Here is Miss Savannah, giving herself a high five in the mirror. Heather took her to the childrens museum, and she had a great time. Don't you wonder what she is thinking? I'm going to try to head out early to work. It is raining now, but the temperatures are supposed to drop, and the rain turn to sleet, then snow. Should be a nice mess when we have to go home tonight. Have a nice and safe Wednesday! TTFN! Day 1073 - Gimme a swig of that deceptive advertising! 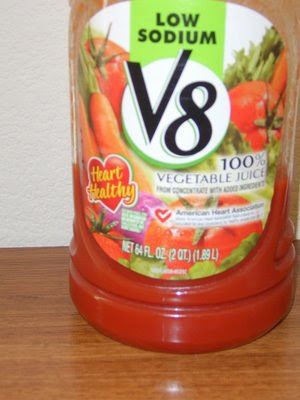 I buy V8 juice - the low sodium variety. I really did believe it would be good for me to drink a can a day, though I might drink about a can every few days. I listened to the commercials, and believed. I bopped myself on the head saying 'I coulda had a V8'. I read the 'Heart Healthy' labeling on the bottle, and believed. It says '100% vegetable juice' on the label too. Do you know that a soda-can sized can of V8 contains 8 grams of SUGAR, and that is the equivalent of two teaspoons? Holy smokes, Batman! Why do they put sugar in 100% vegetable juice? *&^%$# (that is a swear). I feel betrayed. I don't buy juice for Charlie that has sugar added to it, and here I go, telling myself it would be good for me to drink V8 juice. TTFN and read those labels! Day 1072 - Monday already! 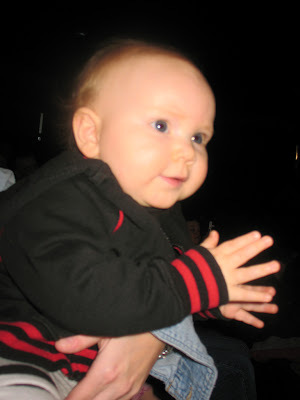 Here's Savannah, clapping at the Elmo show - too cute! She is so SMART, SMART, SMART! We went to the Vanderbilt/Florida basketball game yesterday. We had a great time, except for the fact that Florida was unstoppable, and Vandy was the home team. Florida scored so many three pointers they hardly ever got near enough to draw a foul! Even number 11 for Florida, who looked a lot shorter than the other guys, could throw three pointers with ease. The final score was Florida 94, Vandy 69. Ouch! After that, we went to a place named 'Boscos' - a microbrewery. Boscos was overpriced, and our server was too young to DRINK, so he couldn't tell us much about the beers! (that's funny!) We managed all right with a couple beers, an order of calamari, and an order of crawfish cakes. I did like their music - it was all oldies on XM radio. I'm running kind of late this morning, it's already way after 6. 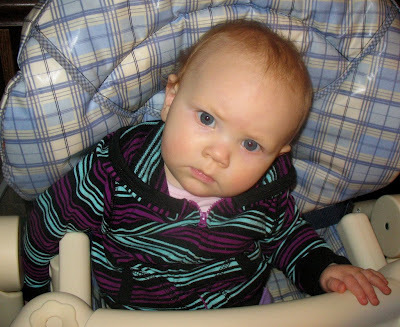 Savannah is a concert-goer already, she went to the 'Sesame Street Live - Elmo Grows Up' show that is touring. Heather - you'd think she was two years old, not 10 months! Charlie and I will be on TV later today - we'll be at the 'Vanderbilt vs. Florida' basketball game. I got tickets from someone at work, so we might be sitting with other people we know. Should be fun! Day 1070 - Saturday - aaaahhhhh! Remember the Cyndi Lauper song 'Girls just wanna have fun'? I was behind a car the other day that had a pink and white bumper sticker. It read 'Girls just wanna have guns'. No time for bloggage, I need to get ready for water aerobics. Whooo, Bloggy TGIFers, it's FRIDAY! Look! It's Yoda-kitty! Use the force to make it Friday, Luke! This has been a very busy week. I am 'bubbly' already just knowing it is Friday. This morning Charlie said 'You're a different person on Friday'; and he's right. Uh - does that mean my usual self is BOOOORRRRIIIINNNNGGG? Probably. Oops - I started reading email in another session and now I'm out of time. TTFN! Day 1068 - Friday minus one! Well, it's hard to even type 'Eve' before 6 in the morning. Did I tell you that airfare prices are coming down with the reduction in gas prices? I wonder if the airlines will rescind some of those 'fees' they added. Jay Leno quipped (when the USAir jet landed in the Hudson river) that USAir charged the passengers an extra fee for the lifejackets. Actually - I am VERY impressed with the pilots on that plane, managing to land the plane with no loss of life. Kudos to those people! Changing subjects - I have a pocketfull of gift cards from Christmas, and I'd like to buy an electric toothbrush - a good one, and rechargeable. What kind do you recommend, bloggy readers? Expensive? Not expensive? The reviews I just read online recommend the Oral B 9400 and Sonicare elite e9500. Changing subjects - everyone send healing thoughts to my sister Marcia, who sprained her ankle yesterday. Get well soon, Marcia! 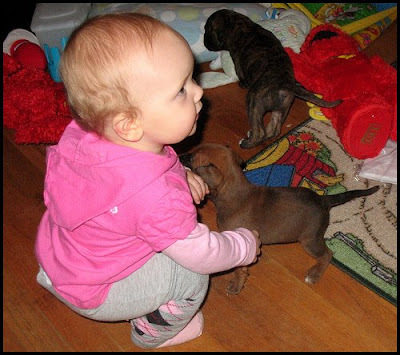 Here's another cute photo of Savannah and the puppies. 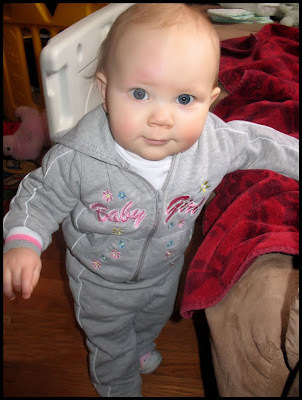 I booked my airfare last night to be in Rhode Island for Savannahs first birthday in March. I hope it doesn't snow - fingers crossed! Hey - I dreamed (dreamt?) last night that I had an operation, and didn't have to go back to the hospital because I had 'dissolving sutures'. I went home and got into bed (even though the pillowcase wasn't on the pillow - what does THAT mean?). The funny thing is - I don't remember what they REMOVED during the operation! Gall bladder, appendix, brain? I don't know! That bugs me! Well, I guess I'll limp into work and try to recuperate - TTFN! 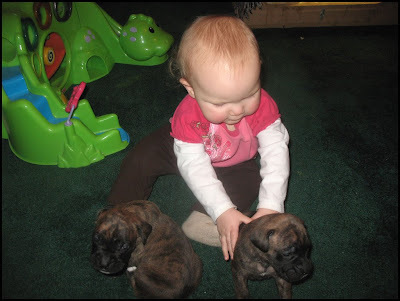 Here's little Miss Savannah, playing with two (count 'em) puppies. When Savi's mother was little, we had a menagerie over the years. 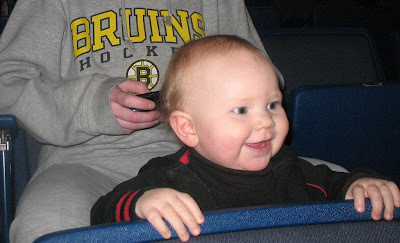 That is the cutest picture, Heather! Changing subjects - last night we went to O'Charleys for dinner (great rolls, by the way). 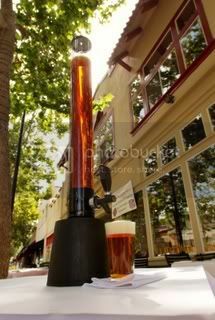 We didn't order one, but they claim to be the only restaurant around that offers beer in a 100 oz 'beer tower'. The manager brought one out for us (so he could brag), and they are way cool! I told him he should get some blue ice fish to float in it. Well, yesterday was a VERY busy day, and I have another one coming up. Better guzzle my delicious foame' latte, and hit the road! TTFN! Day 1065 - Perkatory is Creepatory! Good Morning, Monday morning blah-gers! This will be short, because I'd like to leave early and catch up on some things I didn't catch up on last Friday. (of course, I intended to work a little over the weekend, but I didn't). Followup -remember my blog the other day when I told Charlie he was in 'Perkatory' for having to listen to my perkiness? Well, there is a Perkatory - a coffee house in PROVIDENCE, RHODE ISLAND! I looked for a website, and they have a VERY weird myspace page instead. Go there at your own risk. Buddy Joe suggests that one of my Rhode Island readers go take a photo of the place for the blog! Gotta go! Have a nice Monday! Church sign of the day: God's Tests are 'Open Book'. 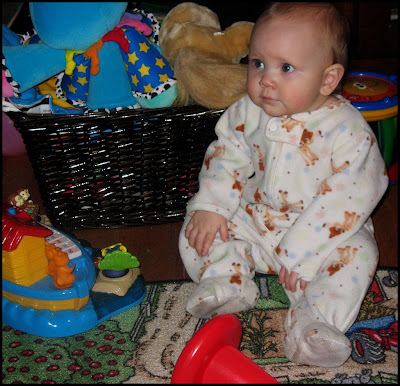 Here's Little Miss Savannah with HER baby girl (doll). 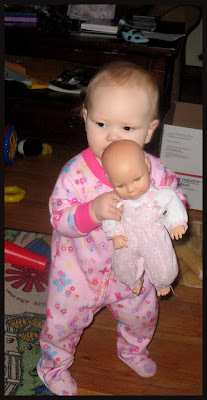 Heather thinks dolls are creepy, but she says Savannah loves it. Just stay away from clowns, yes? What will we name the baby doll? Baldy looks about right... How about 'Rocky Top'? Just kidding. I am still not sure of Savi's hair color - light brown or reddish? Changing subjects - I asked Charlie to tell me a story from his days as a math teacher at a private school. Charlie came in to his class a little late one day. One of the boys was at the blackboard, doing a fair imitation of Charlie teaching class. Not quick enough, though! Charlie asked the boy to return to the blackboard, and told him HE would be teaching class that day. Of course, the boy was dreading that. Charlie sat at his desk and coached the student through the entire class. He did pretty well. At the end, he told him he did a good job, and gave him a couple of bonus points for his effort. The boy was relieved (he thought he was going to end up being punished), and the rest of the class was jealous of the extra credit. Charlie said NOBODY was ever up in front of class imitating him again. It worked! Gotta go swim, now. 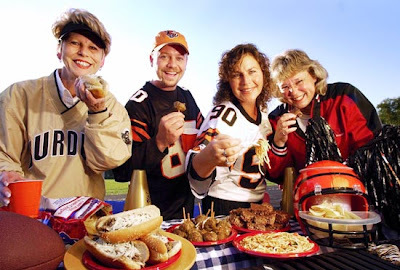 Hope your favorite team has good luck today in the football playoffs! I've been awake and bubbly since 5am, though we napped off and on till 6:30. Charlie is very patient with me when I am over-enthusiastic about the weekend. Buddy Joe said something once about me 'Walking down the hall, FLINGING good cheer'. He's right! Sometimes I am too perky for my own good. That's Perk-atory - a Twilight Zone of cheer, too early in the morning. A former manager nicknamed me 'Pollyanna'. Guess I'd better go hit the water and hope some of this Perky-ness washes off! Actually, you might need to SKATE in a circle. It is a bitter FIVE DEGREES here in Tennessee! Brrrr! I hope Charlie's bees can stay warm in their hive. At least I think it will be sunny, so my CAR won't get so cold outside at work. Changing subjects - I got a new standing lamp yesterday at Goodwill that looks like 'Doc Oc' of spiderman fame. The lamp has several 'tentacles' that you put the lightbulbs in, and you can bend them any way you want to get your 'desired lighting effect'. The shades kind of resemble tulips. So - what did that set me back for a brand new lamp from Target, still in the box? $5.99. Have a nice day everyone, and a nice weekend! Stay warm! Greetings, Bloggy Workin for the Weekenders! 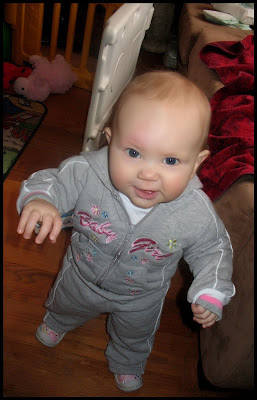 Here is 'Little Miss Adorable', looking all grown up in her jogging suit. Hey - I'd like one just like that. I had a great birthday yesterday, and here it is, almost the weekend already. A few people got together and SANG Happy Birthday to me at work, and it was very off-key and hilarious. Hey - changing subjects - I am not going to wait for Sunday to tell you about the new church sign I passed on my birthday. Let's see - I opened another birthday present last night; a Black and Decker 750 watt blender that has a 'smoothie' setting. I like to make smoothies now and then, and my 'other' blender doesn't crush ice well, so I wanted a stronger model. It came with both a glass jar and a stainless steel one for ice cream shakes and things. Thanks, Charlie! Hey - changing subjects again. I was in 'Big Lots' yesterday and guess who was singing on their background music? David Archuletta, who I had just mentioned! Small world, eh? Well - have a nice Thursday, and remember, tomorrow is FRIDAY! Day 1060 - Happy Birthday to ME! Look at this picture! 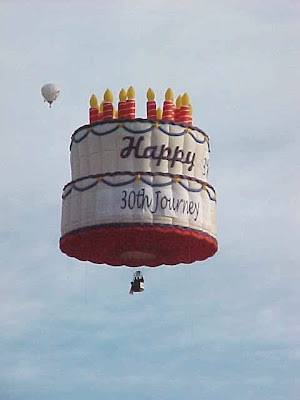 A birthday hot air balloon! No, I'm not thirty - be quiet about that. I've had a lovely birthday already, and I'm saving one more present for after work. Thank you, Family and Friends, for all the nice birthday cards! Thank you, Charlie, for my presents! One of my gifts is a three tier porcelain dip/relish bowl set. I had actually bought one and the bowls were broken, so I had to take it back. Charlie went out and found another! Thank you thank you! Cheryl, you rascal! Your gift was brilliant! Cheryl sent me a magazine with a picture taped over it of Randy Johnson. Cheryl knows I think Randy Johnson is very... unappealing. On the picture she wrote - 'Kiss the frog to reveal the handsome prince'. And behold! Behind the photo of Randy Johnson was a big picture of Hugh Jackman (aka Wolverine), who she knows I like. Charlies comment 'You might need some time alone with that magazine'. Very funny, Charlie! TTFN and have a nice day, even if it isn't YOUR birthday! 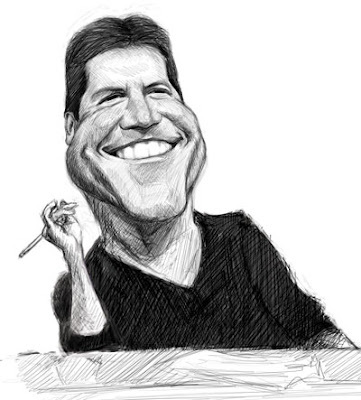 Monday is over, and tonight is the American Idol season premiere. Do you watch American Idol? If you are a hater, better go away and wait for tomorrows blog. By the way - I saw a Christmas CD by Elliott Yamin (former contestant) at Goodwill the other day, so someone is marketing his music. I bought (cheaply) a few Clay Aiken cds, but they weren't good enough to listen to more than once, sad to say. I hear David Archuleta released an album in November, but I haven't heard it. What to expect this season? The New York Times says there will be more hope and less humiliation. I am good with that! 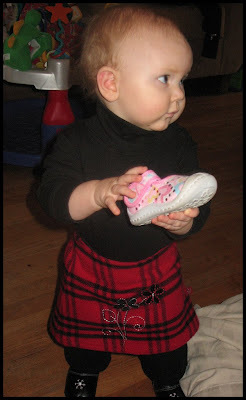 Look at this cute Savi-kilt outfit. Adorable! She is the cutest thing EVER. 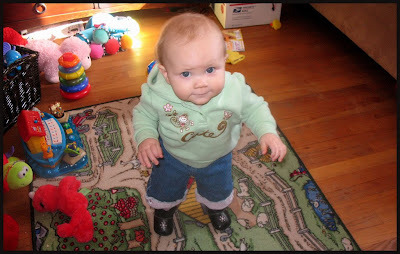 And she still has a 'thing' for shoes, doesn't she? She isn't trying to EAT the shoe, though, that's a 'step' in the right direction. 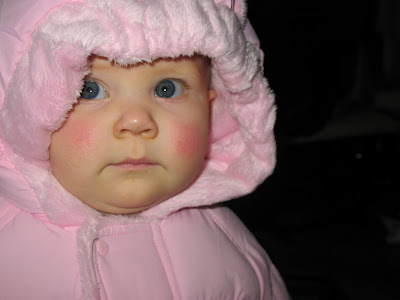 I sent one of the pink snowsuit pictures of Savannah to a girl at work the other day. She wrote back 'She's AWESOME'! I agree. Changing subjects - I was in the health club yesterday after Charlie and I went swimming. I was brushing out my hair before I put it back up in the hair clip I usually use when I am at the gym. Then she came over to the mirror and looked at her own hair, saying 'I am going to have to start coloring my hair. I found 8 gray hairs'. I encouraged her to hold off as long as possible, and she liked that thought. Hey - I've managed so far to NOT color my hair, so I'm STILL holding off as long as possible. TTFN and have a nice Monday! A new season of American Idol starts tomorrow! We had a really nice time with TY and SY at our house yesterday, doing some indoor tailgating during the Titans game. Hot foods were Hot Velveeta/Rotel dip with organic tortilla chips and chicken meatballs with pineapple and teriyaki sauce. We had guacamole (Wholly guacamole brand), peach-pineapple-chipotle salsa, Fritos and Sunchips and Kettle-style potato chips, Trader Joes cranberry goat cheese (outrageously good) with Triscuits and wheat Ritz crackers, a relish tray with tiny pickles, a variety of olives, nuts, figs and dates, a veggie tray, and some fried and dried vegetables that you can use to dip with too. Lets not forget beer and wine. We never made it to the rotisserie chicken and ice cream I had for 'later' - 'later' never came. Unfortunately, the Titans lost, due to some really badly-timed fumbles. Sheesh. Guess I'll put my Titans jersey away till next year. We'll do a little less of that today, because we're still full from yesterday! Have a great Sunday - Heather and Gil - I hope you're feeling better! Day 1056 - The weekend is here! Greetings, and welcome to the Bloggy Infirmary! 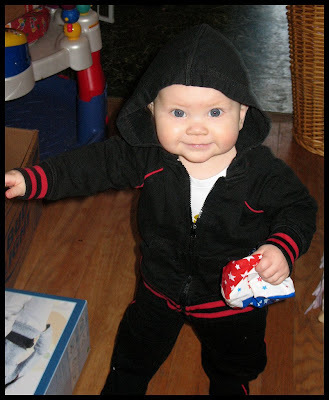 Heather is sick, Gilbert is sick, and I just didn't want to write 'Greetings, Bloggy Sickos'. It doesn't sound right. I just got up long enough to write the blog, grab a foame' latte' and go back to bed and read for a little bit. I'll get back up in an hour to go to water aerobics, then the grocery store. TTFN, get well, and have a nice Saturday! Day 1055 - FRIDAY, Hooray! Heather - I love the new video, by the way! It's cold outside right now, but we had a few warmer days earlier in the week and evidently some bugs hatched. Charlie has a few bites (bug unknown) and this morning I looked at him and said 'How are your insect hickeys doing'? I am very happy it's Friday, and (of course) have a lot to do today to catch up before I can call it quits for the week. Day 1054 - Spending Money to Save Money? Whassup with gas prices, readers? They are supposed to be going DOWN, not up! I heard on the news that they are expecting gas to go back up to the $2 range. Whassup with that? Other grades of gas and home heating oil didn't even come down all that much, particularly diesel gas. We got a propane delivery this week - $700. I don't think the price of propane came down very much. So anyway - before I started griping about the price of fuel, I was actually going to try to understand my motivation, spending $75 a year for Sams and Costco memberships. YES, the gas prices there are a few cents cheaper per gallon. YES, I can get good deals on food items there in bulk. YES, I can get good prices on things like light bulbs and batteries. However, I am not quite sure overall how much SPENDING that money in order to SAVE money is working... I am sure we come out on the positive side, but how MUCH on the positive side? No clue. 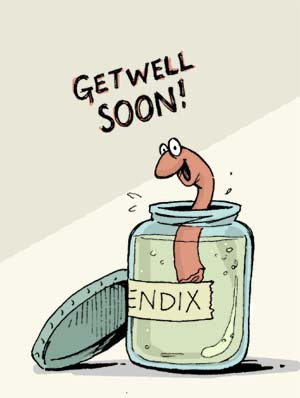 Appendix report - Gilbert is already home and I spoke to him on the phone yesterday. He sounded good, and was also surprised the hospital didn't keep him longer! No disrespect intended, but it is shocking that they can do surgery, take out something inside you and send you home the next morning! Eeek! Gotta make this short, my overnight jobs haven't finished this morning. Day 1052 - Get well soon, Gil! My stepfather had his appendix out yesterday - while my mother was picking up my sister at the bus station! My mother said his stomach had been bothering him for a few days. He went to the doctor. The doctor sent him to the hospital. The hospital admitted him, and didn't waste any time scheduling his surgery. That all happened so fast there wasn't time for a crowd of people to appear at the hospital and wait in the waiting room during his surgery. I find that a little sad, to be 'alone' during surgery with the exception of doctors, nurses, and a million other hospital staff and patients. Poor Gilbert! I guess you don't KNOW though - you're asleep! Aren't you? Do they knock you out when you have your appendix out? Probably so. TTFN and Get Well, Gil! Savannah is looking at us like we're all aliens... and maybe we are! Maybe it's not really Monday but we're in the Twilight Zone! Maybe we're in an alien spaceship and they're going to study us in our work environment! Maybe I'm just babbling because I don't have much to talk about! I've taken all the ornaments off the Christmas tree except for birds and pine cones. I'm going to see what it looks like in the 'art room' - and if it doesn't enhance the room, we'll have to get it back into the box. (dread) If it looks good, I'll leave it in there - greenery is greenery, we'll see. We have a new person starting today and I need to meet her at orientation and take her to lunch. Day 1050 - It's Sunday - where does the time go? 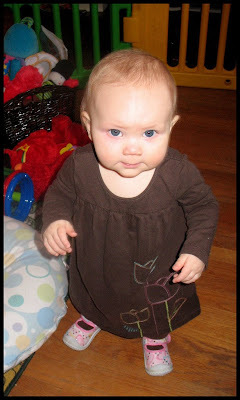 Here is our little blessing - Savannah, looking like she's concentrating on her balance when walking. Look at her little feet! PRECIOUS! Okay, I know I didn't write a blog yesterday - Charlies daughter, son-in-law and grandson came over for the day, so I was busy being a baby hog and making food! I took a photo of both Charlie AND the baby nodding off in his recliner - but I haven't downloaded it yet. Charlie and his son-in-law are off hunting this morning, so I am going to go swim and run errands. I have decided I'd like to get some of those old fashioned Christmas tree lights with big, fat bulbs like we had in the 50's. I don't know if any of the stores still have Christmas clearance, but I 'heard' yesterday at water aerobics that Target still had a lot of stuff. Gotta go over there today. Speaking of Christmas, I have started taking down my Christmas stuff with great reluctance. Boo Hoo! I've put away several wreaths, wall hangings, Christmas pillows, Christmas blankie, etc. I'll do the tree later today, then I'll be almost done. Guess I'd better go swim, it's already 8'oclock! 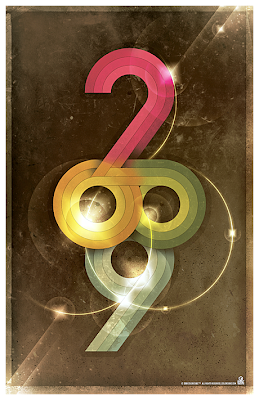 This is a 'different' sort of 2009 representation - what do you think? Back to work today, but just for one day, then two days off again. Just like after Christmas. I don't want to take down the tree - but I guess I have to this weekend. I don't want to take down the decorations around the house - but I guess I have to this weekend. I already got my 2009 IRS forms in the mail - not my W2s of course, just the packet with the forms and instructions. 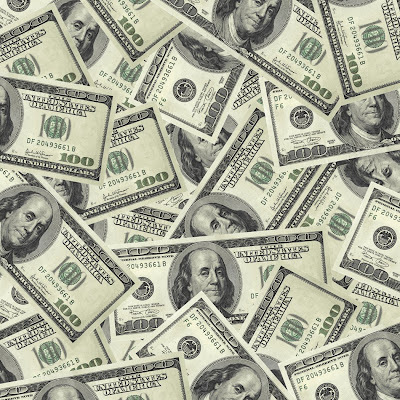 Do you think we'll get another round of economic stimulus checks this year? If they want to bail ME out, I'll take it. Oops - just noticed the time. Have a great New Years Day plus one - and don't forget to write 2009 on your checks! Day 1047 - Happy New Year! This picture of Savannah expresses how many of us may feel today after staying up late last night. SOME OF US may have even napped a little during the evening while we had company. Uh... that would be me. Let me start the New Year by saying that there is nothing worse than the New Years Eve countdown shows on television. They are absolutely awful and give 'Lame' a whole new meaning. Our New Years Eve early supper at Papa Boudreauxs was delicious as always. I had the extra large gumbo. The waitress warned me about the quantity, but I only brought home a tiny bit of it. YUM. They were having 3 different seatings of New Years Eve dining, but we were the earlybirds and the place was filling up when we were leaving. Funny thing - when you eat supper at 4pm, by 6pm you think it's SOOOOO late! Anyway - Happy January! I like January because I have a birthday in a couple of weeks, and I can start looking forward to my tax refund. TTFN and Happy New Year!